The Dow Jones Industrial Average today (Friday) added another 102 points, while the S&P 500 completed its largest weekly gain since July. The S&P 500 was fueled by Gilead Sciences Inc. (Nasdaq: GILD), which added nearly 2% today on news the company completed its $10 billion debt offering. Traders are speculating the biotech giant is poised to make a big acquisition in the coming weeks. Meanwhile, shares of Shake Shack Inc. (NYSE: SHAK) gained more than 13% after receiving a series of upgrades. The S&P 500 Volatility Index (VIX), the market's fear gauge, dipped 3.8% on the day. 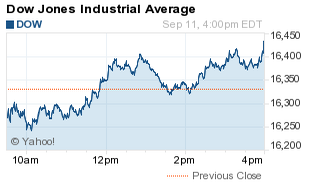 Stock Market News: The Dow added 102 points, but the energy sector held back Friday's possible rally. Oil pricesslipped this afternoon as traders raised concerns about oversupply in the way of yesterday's crude inventories report from the U.S. Energy Information Administration and news that Goldman Sachs Group Inc. (NYSE: GS) cut its price outlook for energy commodities. In fact, the investment bank said oil prices could fall as low as $20 per barrel. Today, WTI prices dipped 2.4% to reach $44.82. Meanwhile, Brent oil prices lid more than 1.4% to hit $48.19 per barrel. The downturn in oil prices is creating a remarkable buying opportunity in the energy sector for savvy investors, particularly in multinational energy companies with a massive global presence. Here's Money Morning Chief Investment Strategist Keith Fitz-Gerald outlining the one stock that you must own with oil prices this low. On Tap Monday: A light economic calendar in the United States hits the markets on Monday, but don't think traders are going to be lulled to sleep. Investors are keeping a tight eye for any clues related to the critical FOMC meeting in which the U.S. central bank will decide whether to raise interest rates for the first time in nearly a decade. On Monday, companies reporting earnings include Hanger Inc. (NYSE: HGR) and Energy XXI Ltd. (Nasdaq: EXXI). Stocks to Watch No. 1, ZUMZ: Shares of Zumiez Inc. (Nasdaq: ZUMZ) slumped more than 32% this afternoon after the sports apparel firm reported weaker than expected sales and profits for the third quarter. Stocks to Watch No. 2, AVP: Shares of Avon Products Inc. (NYSE: AVP) fell more than 15% after markets rejected rumors that the struggling beauty products manufacturer is in talks about a potential sale to private equity firms. Stocks to Watch No. 3, ZSPH: Shares of ZS Pharma Inc. (Nasdaq: ZSPH) gained more than 3% on news the company is in talks to sell itself to Swiss drugmaker Actelion. Stocks to Watch No. 4, PHM: Shares of U.S. homebuilders were up this afternoon after receiving strong price target upgrades from investment form JPMorgan Chase & Co. (NYSE: JPM). Shares of PulteGroup Inc. (NYSE: PHM) added more than 2%, while Meritage Homes Corp. (NYSE: MTH) gained 2.8% after JPM reiterated its positive outlook for the U.S. housing sector.